Midseason motorcycle gloves! 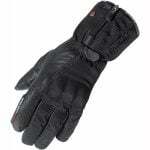 These waterproof gloves are great for spring and autumn riding. They're unlined so you can stay cool, but if you do get caught in the rain you can rely on Gore-Tex's premium waterproofing. Gore-Tex is a highly breathable membrane, so you won't get sweaty hands! "The gloves arrived pdq and looked and felt good quality. I measured my hand prior to ordering medium but they are very snug. I was hoping to wear an under glove if it was chilly but they are too tight. However as a summer glove they are nice. I chose Richa as I have both leathers and a gore tex suit from them and the build quality is great."